Daily lenses are meant to be worn once and thrown away and monthly lenses are designed for a month’s worth (30 days) of wear before being replaced. It can be helpful to mark in your diary/calendar when you first opened a new pair of lenses so you can keep track of how old they are. Do not sleep in your lenses unless your optometrist has advised that this is acceptable. Over-wearing of your contact lenses puts you at greater risk of adverse contact lens-related events, such as infections that could blind the affected eye! Only use appropriate, recommended contact lens cleaning solution and use fresh solution every time - this means tipping out the old solution, not just topping it up. Cover the lenses completely in solution and replace your contact lens case every three months. It is advisable to rub your lenses as this removes built-up proteins, making the lenses comfortable for longer period of time and decreases the risk of infection and inflammation. Patients that wear their soft lenses during sleep put themselves at more risk of infection because the contact lenses do not get cleaned as frequently. If you cannot remove your lenses each night for sleep, remove them weekly at the least to give them a good clean and eliminate the bacteria and protein building up on your lenses. Monthly silicone-hydrogel lenses recommended by your optometrist are the only soft lens that should be worn overnight. Not all solutions are created equal and changing between them may give more irritation due to different preservatives or they may not condition your type of contact lens as effectively. Try to keep using the solution your optometrist recommends. Solutions are always available in the practice or can be purchased at our online shop here. This should go without saying, but washing your hands prior to handling lenses is an absolute must. Antibacterial hand wash is recommended. If you wear make-up it is advisable to put your lenses in before applying make-up, and to remove your make-up before taking out your lenses. Red eyes are not happy eyes. Do not wear your lenses if your eyes are red, irritated, sore, or have any discharge. If you accidentally sleep in your contact lenses it is best to remove them for a day to allow the eyes to recover. If you are wearing your lenses and your eye becomes irritated, remove the lenses immediately. If the symptoms do not stop, you may have an infection and you need to see your optometrist urgently for appropriate treatment. Contact lenses are a great alternative to glasses but should not be your only form of optical correction. If your eye is red or sore you should not wear your contacts until they are better. If you are unwell with a cold or flu it is best to give the eyes a break from contact lens wear. These situations are where you will need those back-up glasses so you can still go about your daily life. Not having a pair of back-up glasses may also tempt you to overwear your contact lenses which puts your eyes at risk of inflammation or infection. Contact lenses are encouraged to have an annual eye check. This is to ensure that your lenses are still fitting well and not causing any damage – some contact lens complications have no symptoms. It is also to check that your vision is as good as it can be, and that these particular lenses are still appropriate for your needs. Do not use any product that is past its expiry date. It is a good idea to mark the date of opening on your bottle of solution so that you know when it needs to be thrown out. Most solutions don’t keep for more than 3 months once opened – this is because the preservatives start breaking down so the solution is no longer guaranteed to disinfect your lenses. This is common when the lenses have been in your eyes for 10+ hours, especially if you are in an air-conditioned or dusty/windy environment. Lubricating drops (such as Hylo-Fresh and Hylo-Forte) are a simple solution. Make sure your solution is contact lens compatible and if unsure check with your optometrist first. Some modern-day disinfection solutions such as Aosept Plus with Hydraglyde have components to help maintain moist lenses throughout the day. New contact lenses types are released every year with new technology to keep your lenses moist for longer. Ask your optometrist about these products and if they are suitable for you. Take your lens out and check that it has been inserted correctly. Often a lens appears normal but has been flipped inside out. If you are not sure whether your lens has been flipped or not, a sure sign is irregular shape around the edge – lenses should be perfectly circular around the bowl with no kinks. If you have a toric contact lens (for astigmatism, try to get the markings lined up correctly. Check the lens for signs of damage such as chips or scratches. If there is damage throw it out and use a new lens. Dust may be trapped beneath the lens – try to drag the lens onto the white of the eye then back, as this can often roll the debris out without the need to remove the lens itself. After wearing lenses all day, the lens is often dehydrated due to air exposure. Put a drop of artificial tears into both eyes, blink a few times, and try to remove the lens again. If difficulties persist it may be a good idea to have your optometrist or contact lens assistant review your technique to see if this could be improved. Keep your fingernails trimmed – long or ragged nails are more likely to damage your lenses when you are handling them, and they are also more likely to scratch your eye. Be careful swimming in your contact lenses. There is a chance they will wash out and you will lose them and pool water particularly increases susceptibility to infection. Prescription goggles are available if you do a lot of swimming. If you do swim in your lenses it is advisable to throw them away afterwards. Daily disposables or orthokeratology (overnight corneal reshaping) may be best suited to patients with heavy involvement in water sports. 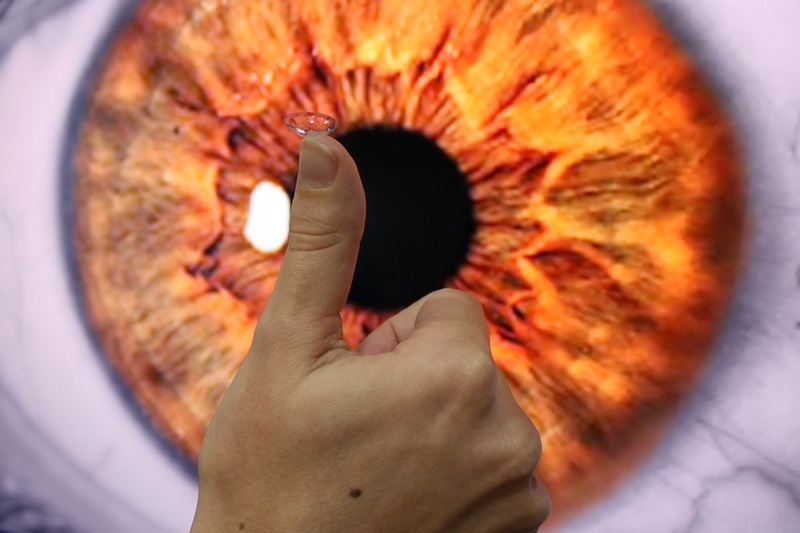 Contact lens wearers have an increased risk of infection. This risk is increased for monthly lens wearers who are reusing lenses, unlike daily lens wearers. The risk also increases when you sleep in your lenses. It is important to keep this in mind and to look after your lenses and disinfect them well. Saliva and tap water are not sterile! Both are home to different strains of bacteria that may not be harmful to us when we ingest them but can cause infection and other issues when they come in contact with our eyes. Do not use either of these to clean or store your lenses in. Lens purchases online may not be genuine, may have been stored or transported incorrectly and carry a higher risk of infection according to new studies. Lenses purchased from your optometrist are guaranteed to be direct from the manufacturer and it is much easier for your optometrist to help you should you have any issues with the prescription or comfort. We can also courier contact lenses to you for your convenience!